These are the games that require an amount of logic and quick thinking, used towards finding a goal in each phase. The Assembler series is an extraordinary title that I found this last month. 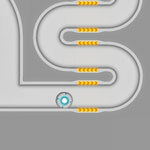 It is another game that uses hand-physics, and a game where you must use those self-same physics to your advantage, stacking the shapes so that the green shape fits neatly in the slot meant for it. There is also buoyancy in underwater stacking that must be considered, as well as the weight of the shapes being stacked. A really incredible title that won me over with it's most addicting gameplay, so I'm giving it no less than 5 out of 5. 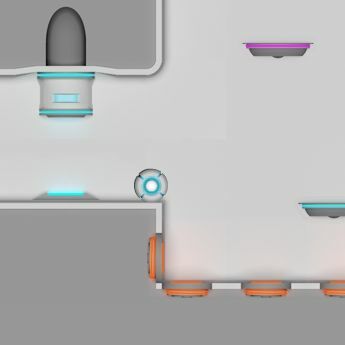 In this logic twister, you have two robotic boxes in seperate rooms. You can generally only move one at a time, and in one of the rooms will be a checkered goal zone. To move on to the next level, get the box in that room into the goal zone. These are often are obscured by gates, which you can retract by stepping on the same color switch in that room. The problem is , oftentimes the gate will retract only to close off the path in the other room. Some switches are concealed in crates, which you can only break by sliding into the space between a wall and a closing gate, like a trash compactor. 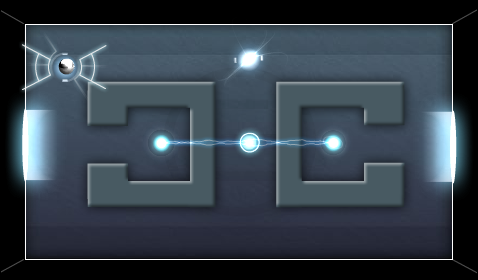 Then there are also teleporting panels, and power-ups which can reduce you in size and make both boxes move at once. A great game, really. It might sound confusing at first, but each level introduces a new item and how to use it, so you understand it after a while. With 30 levels, it will keep you entertained for a while. 4 out of 5. In this wood-splitting title, you must guide the very eager smiley face to the exit portal by cutting the wooden blocks that it it perched on, as well as the chains that they dangle from. Brick walls under no circumstances can be moved or cut, but while gray blocks cannot be cut either, they can easily move or rotate on chains. 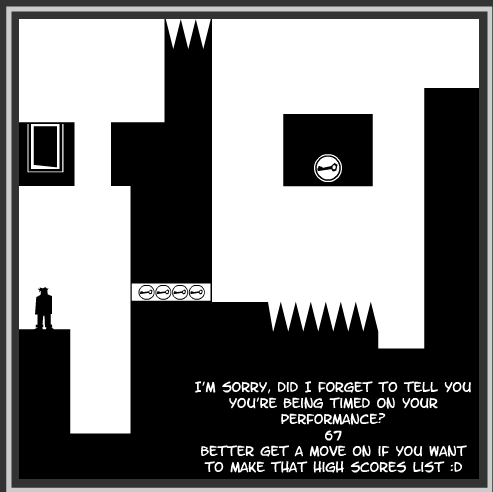 This physics -involved game is fun not just because of it's fresh gameplay, but also because of the way it makes you think to solve the puzzles. If you do not cut the blocks at just the right angle, then it may work, but in a different way than presumed. You also generally have a limited amount of cuts to use. It's definitely worth the effort to play, so check it out. 4.5 out of 5. 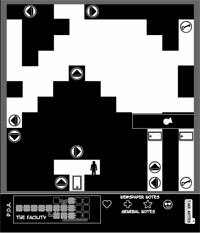 Shift is a unique puzzle game that allows you to "flip" the stage, so that what was black is white, and vice-versa. This is called "Shifting", and you use it with the Shift key. 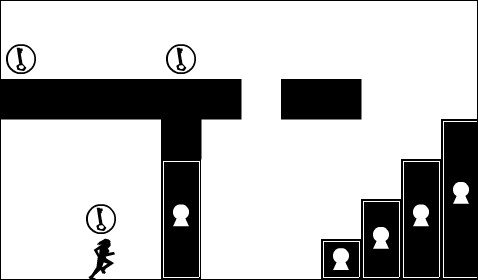 The key platforms cannot be shifted on, but rotate to cover spikes or create platforms if you collect the floating keys. 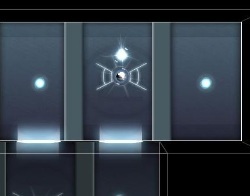 In Shift 2 you can make you're own Shift puzzles. 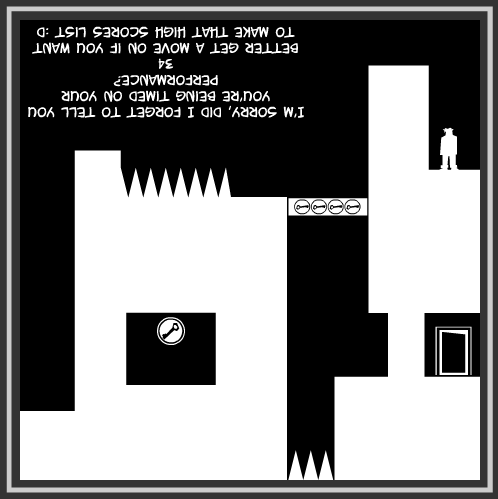 Shift 3 offers a more advanced storyline with an auto-save feature, and also includes the level editor. This is a fun and challenging game series that I think deserves a 4 out of 5.